Okay, I didn't get this boot just because I didn't have a brown boot, though that's reason enough as this is a gorgeous brown! This is Vallera by Blondo. Made with waterproof leather, after the initial leather protecting treatment, all you have to do is just wipe the winter salt off with a damp cloth and they're good to go. The full length inside zipper with the back elastic insert will make sure it's a comfortable fit as well. This is my favourite style for the city boot. 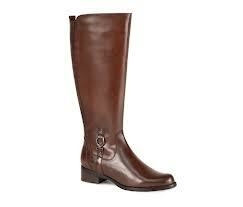 With it's refined, classic equestrian look it'll be in style for years to come - decades even. 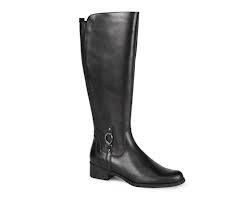 They have the clean, beautiful lines which made the equestrian boot the classic that it is and which makes this a must have for every closet. It is very comfortable and fits true to size. It can be a little difficult to get on; the back of the heel is quite rigid with not a lot of give, so when you're slipping your foot in you have to give it a good tug. However, once you have it on, it forms perfectly around your foot for an absolutely comfortable fit. As always, you get what you pay for, but in this case, you're getting quite a lot more. It averages around $235... which is a great price for a boot you'll wear for years.